An essential cottage garden annual. 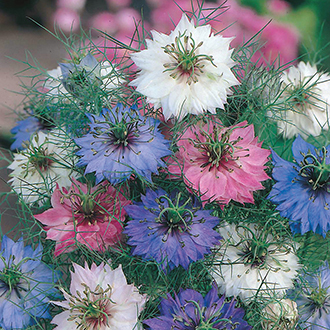 Fast growing, its fine foliage and blue, pink and white flowers are only part of its appeal. Also an excellent cut flower and the dried seed heads make for a splendid winter decoration. SOW OUTDOORS March-May or September. Depth: Quarter inch/0.5cm. Thin out as necessary. Spacing 9in/23cm. Keep moist.